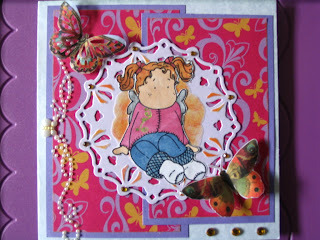 Here is a card I did for the Magnolia-licious July mingle group on yahoo, this month it was all about butterflies. I used a Martha Stewart butterfly punch for the the one at the top of the card and then cut out the one at the bottom from Recollections Tatton Garden design paper. I'm also entering this card into the Beary Sweet Challenge #6 or BSC6, this time it's a sketch challenge. Their challenges runs on the first and the 15th of each month. They offer products from their very own Beary Scrap shelves. There's still plenty of time to enter, go over and check it out, you have until July 31, 2010 to enter. Very cute and colourful! Love the way you punched the butterfly from colourful paper too! What a great effect! How adorable. Love the butterflies. The medallion she's sitting on is gorgeous. Where did you get (or make) it? O really love your punched die that Tilda is sitting on and I'm a big softy for flutterbys. Love them! Just so sweet! 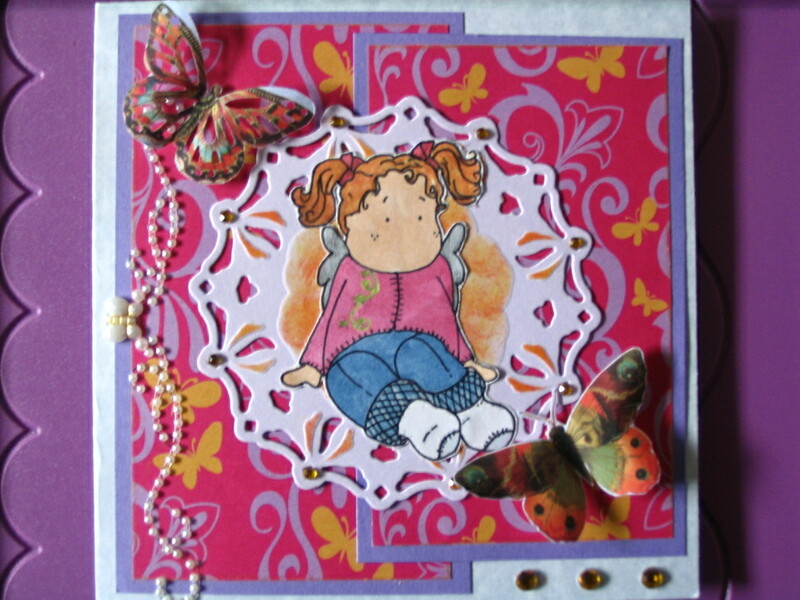 Love your card....your butterflies turned out great. oh wow! This is gorgeous! I love the bright colors and those butterflies are the loveliest touch!!! Thank you so much for joining us at the Beary Scrap Challenge! Aww, this is so cute! I love the pearl swirls - I haven't seen them before. Excellent job! Thanks for joining our Beary Sweet Challenge - good luck! How summery, I love it! I especially adore the butterflies and the pearl trail. Great job! Thanks so much for joining in our Beary Sweet Sketch Challenge.